You can cruise along the palm fringed waterways of Kerala in a luxury houseboat. You can have fixed tour packages as well as customized ones exclusively for you in an houseboat. This HB 01 A takes you for the night and two days through the Alappuzha Backwaters with you staying the night in the houseboat. To know more about the package read through. 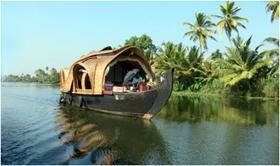 Kerala Houseboat Package: HB-01A is an exclusive houseboat package. This is a single bedroomed house boat with all the facilities and only one couple with / without children can cruise for a night and two days over the Kerala Backwaters in India Destination covered will be Cochin and Alappuzha. You will be met at the The Kochi international airport or the Ernakulam Railway station and will be taken to Alleppey . The trip will take about 120 minutes. You will be taken for a cruise in and around Alappuzha and the overnight stay will be in the houseboat . The Boat will be anchored for the night. and taken to Cochin. and dropped at the Airport or the Railway station for your onward travelling destination. The cost of the above tour package will differ from season to season. You can get in touch with the authorities for the actual and correct fare for the HB01A Tour Package. Welcome drink plus the three meals, namely, breakfast, lunch, dinner will be provided. A/c in the bedroom functions in the Houseboat throughout day and night. The pickup and drop will be from Cochin (Kochi ) for the above package. The cruise would be in and around Alleppey. The nearest airport is Cochin International Airport and the travel time from Cochin (Kochi) to Alleppey (Alappuzha) is 120 minutes by road. The package starts with lunch & ends with breakfast. The above houseboat cruise is for TWO Adults on exclusive basis and is not part of a Group Cruise. Payment can be made by Fund Transfer/Cheque/DD/ Credit or Debit Card online, on confirmation of the package. The check-in time is 12 noon and the check-out time is 09:00 Hrs. The check-in / Out point is Pallathuruthi, Alleppey. The travel time from Alleppey bus station to Pallathuruthi is 15 minutes if you are travelling by road and from Alleppey Railway Station is 20 minutes. and anchored amidst the backwaters for the night. FundTransfer / Cheque / DD / Credit or Debit Card online / offline.